Utah Gov. Gary Herbert has declared a state of emergency in advance of potential flooding from the remnants of Tropical Storm Rosa. The National Weather Service on Tuesday issued a flash-flood watch for much of Utah as what remains of the storm moves across the state. Herbert says communities near burn scars created by recent wildfires are at increased risk for flash flooding and debris flow. On Monday, Herbert mobilized about 200 National Guard soldiers to prepare for potential flooding south of Salt Lake City. The soldiers planned to build flood berms and erect barriers and sandbags. The tropical storm drenched parts of the desert Southwest on Tuesday, trapping drivers on swamped Phoenix streets as authorities prepared for possible flash flooding in Arizona, central Utah and elsewhere. Record-setting rainfall that has flooded streets and given metro Phoenix a hefty soaking is dissipating. National Weather Service forecasters say there were still scattered showers from remnants of Tropical Storm Rosa by Tuesday afternoon but they were far less widespread. Meteorologist Jaret Rogers says Phoenix received more than 2 inches (5 centimeters) of rain, making it the city’s second wettest October day on record. However, he cautioned that even a little rain could produce more flooding. Rogers says the moisture from the storm is expected to move out of Arizona by Wednesday afternoon and bring rain to Utah and Colorado. Flash flood watches are in effect in parts of Utah and western Colorado. 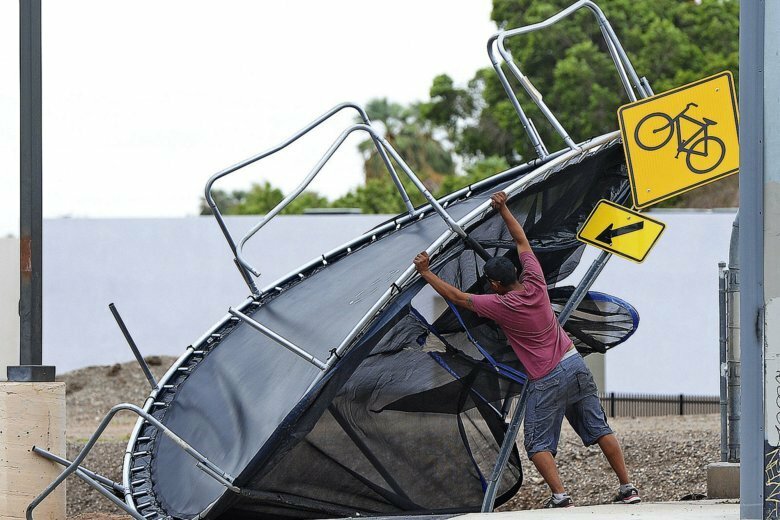 Rosa, which was a hurricane until last Sunday, has already brought heavy rains to northwestern Mexico and the Baja California Peninsula. Hurricane Sergio has grown to major hurricane status in the Pacific, though it poses no immediate threat to land. The U.S. National Hurricane Center says the storm now has sustained winds of 115 mph (185 kph), making it a Category 3 storm. It’s centered about 870 miles south-southwest of the southern tip of the Baja California Peninsula and has been heading west at 13 mph (20 kph). Forecasters say they expect it to keep moving out to sea. Phoenix firefighters have rescued at least six people including a small child from vehicles trapped in a flooded intersection caused by rain from the remnants of a tropical storm. The rescues broadcast on TV Tuesday morning showed firefighters slogging through nearly waist-deep water and carrying people one at a time to a firetruck. A nearby riverbed that is normally dry overflowed, spilling muddy water onto the street. About 10 vehicles including a bus were at a standstill in the water or trying to drive through it. Some streets and schools were closed in the metro Phoenix area after more than 2 inches (5 centimeters) fell. There was also flooding reported around Tucson. Heavy rain and flooding from the remnants of a tropical storm has forced several schools in metropolitan Phoenix to close. Severe flooding shut down four Phoenix-area schools Tuesday. Several busy intersections also have closed. The region is getting drenched from Rosa, a hurricane that turned into a tropical storm and is now a tropical depression. The National Weather Service says Phoenix Sky Harbor International Airport has received more than 2 inches (5 centimeters) of ran so far Tuesday. It has warned of possible flooding in urban areas, including highways and underpasses. Forecasters say that even if the rain dwindles later in the day, some roads and washes will likely keep flowing. Flash flood watches are effect in parts of Arizona, California, Nevada and Utah. The National Weather Service has issued a flash flood warning for the Phoenix area after remnants of Tropical Storm Rosa dropped heavy rain, slowing the morning commute. The weather service Tuesday said flash flooding was expected after up to 2 inches (5 centimeters) of rain fell in metro Phoenix by midmorning, with more rain expected. Trooper Kameron Lee of the Arizona Department of Public Safety said rain “played a factor” in numerous car accidents during the morning Phoenix commute, but there were no reports of serious crashes. Utah Gov. Gary Herbert mobilized about 200 National Guard soldiers Monday to prepare for potential flooding in areas where recent wildfires left burn scars that could increase runoff. Rain from the remnants of Tropical Storm Rosa slowed the Phoenix area’s morning commute traffic as authorities prepared for potential flooding across the desert Southwest. Flash flood watches were in effect for parts of Arizona, California, Nevada and Utah due because of Rosa, which had been downgraded to a tropical depression. The Maricopa County Flood Control District reported no immediate reports Tuesday morning of flash flooding in the county that includes most of metro Phoenix. But the National Weather Service warned that heavier rain was expected Tuesday afternoon. Forecasters said 1-2 inches (3 to 5 centimeters) of rain were expected in central and southern Arizona, with up to 3 inches (8 centimeters) possible in higher elevations. After soaking northwestern Mexico with heavy rains as it neared the Baja California Peninsula and reportedly claiming at least one victim, Tropical Storm Rosa is expected to drench the U.S. Southwest. From Arizona to Utah, some residents filled sandbags in anticipation of heavy rainfall forecasts and potential flooding. The center of Rosa, which was a hurricane until late Sunday, was expected to hit Baja California and Sonora by early Tuesday, bringing 3 to 6 inches (7.5 to 15 centimeters) of rain, the U.S. National Hurricane Center said. It’s then expected to move quickly northwestward as it weakens, bringing 2 to 4 inches (5 to 10 centimeters) of rain to central and southern Arizona and 1 to 2 inches (2.5 to 5 centimeters) to the rest of the desert Southwest, Central Rockies and Great Basin. Isolated areas might see even more precipitation.